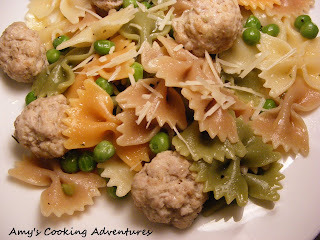 I am always on the lookout for a good pasta recipe, especially one that is quick, easy, and doesn’t have a heavy sauce. This recipe is called “Naked Ravioli” because all of the goodness that is usually inside the pasta is on the outside. This makes an oh-so-yummy dish without having to break out your pasta maker (which I don’t have…sad). 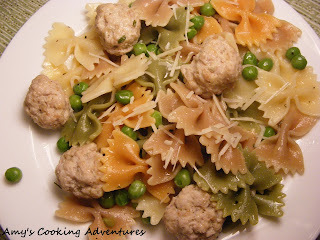 In this recipe, you cook your little filling meatballs in boiling water first and remove them, and then add the pasta. Smart. Move. All the delicious flavors from the meatballs get into the pasta and you only have to make a very light sauce to get a wonderfully flavorful dish. Win. Combine pork, egg, cheese, parsley, bread crumbs, and onion powder. Roll into small balls, about 1 inch in diameter. Bring a large pot of water to boil; add 1 tablespoon of salt. Cook meatballs in boiling water for 7 minutes. Remove with a slotted spoon, cover, and set aside. In the same water used to boil the meatballs, cook the pasta to al dente. Add the frozen peas for the last 5 minutes. Reserve ½ cup of the pasta water. Drain. Meanwhile, cook the olive oil, rosemary, salt and pepper in a small pot, about 5 minutes. Whisk in the ½ cup of pasta water. Toss pasta with the olive oil mixture and meatballs. Top with grated parmesan cheese and serve. Sounds like a good recipe! I like how you used different colored pasta for color! We had this for dinner tonight! The kids loved the colored pasta; Delicious!